Forundring på klosteret klostre Meteora på en 2-dages skiltur fra Athen. Rejs nordpå med tog til Kalambaka og efter fritid at udforske og slappe af, overnatte i et 3- eller 4-stjernet hotel. Næste dag kan du nyde en guidet morgentur i de UNESCO-listede middelalderlige klostre, bygget på toppen af ​​gigantiske sandstenstole. Din rejse inkluderer returbilletter, overnatning, om morgenen Meteora tour og morgenmad og aftensmad på dit hotel. Fang 8,27 tog til Kalambaka fra Athen Station og nyd en afslappet rejse, der giver dig mulighed for at beundre det græske landsbygds skønhed. Ved ankomst til Kalambaka station omkring kl. 13:30 mødes din engelsktalende chauffør, der vil holde et skilt med dit navn på det, og hvem vil overføre dig til dit hotel. Du vil få hele eftermiddagen til frit at opdage denne maleriske lille by, bygget ved foden af ​​de majestætiske grå klipper kronet af Meteora klostre. Må måske besøge Natural History Museum of Meteora og Mushroom Museum. Udforsk museets samlinger og se champignonene, bemærkelsesværdige for deres mange forskellige former og farver, som du finder ud af de arter, der trives i Grækenland. I aften er aftensmad inkluderet i hotellets restaurant. Næste morgen skal du møde din lokale guide i hotellets lobby og afsted for at besøge to af de vigtigste klostre i Meteora og opleve områdets naturlige skønhed og kulturarv. Din morgen tur vil transportere dig tilbage til de mørke aldre og historien om de første eremitter og munke, der lagde grunden til, hvad der senere ville blive klosteret af Meteora. Lær hvilke kloster, der var den første, der blev etableret, og de sande motivationer bag munkernes beslutning om at prøve at klatre op ad de stejle bjergkniv og bygge klostrene på deres toppe. Efter din morgentur, overfører din chauffør dig tilbage til Kalambaka, hvor du får tid til frokost (egen regning). Fange klokken 17:22 tilbage til Athen fra Kalambaka, der kommer tilbage i byen kl. 15.15. We visited two monasteries and a nunnery. Taking the train up the day before, we walked around the town and ate a late lunch. The views and the scenery were amazing and the history of area was interesting. Our tour guide was great, just expect to pay 3 euros at each place. We rode up on the train in A seat which made the trip more comfortable. Expect at the train station in Athens at night to have to haggle with the cab drivers some tried to charge 3 times the cost. Everything was very nice. The site is breathtaking! The guide and driver were very well informed, friendly and helpful. Our hotel was beautiful. We had a fantastic view from our room. The four hour tour through Meteora was amazing! The process to get there -- not so much! I booked the trip over the phone, then got an email saying first class was no longer available. So we agreed to second class. I then got a second email telling me we do not have hotel transfers in Athens, which was weird since the gentleman I booked with had asked for our pick up and drop off hotels. So we found our own transfers. Then I got and email saying I did not have to print my voucher. So we did not print them. When we arrived at the Athens train station there was no one there to give us our tickets. We got on the train and had to turn on our international phone plans in order to call Key Tours to find out how we were going to show the conductor our tickets. Apparently, at the bottom of one of the many emails we had received was one line with my name and .pdf and that is where the tickets were located. When we got off the train in Kalambaka, there was no one there to meet us. Again, we had to call Key Tours and have them arrange for us to be taken to our hotel. A taxi driver arrived and took us there. The next morning, we went on a great tour to see three of the monasteries. That was the best part of the two days. Meteora is an excellent destination. Just be prepared for a few setbacks along the way. Get to Meteora any way you can. It is well worth any inconvenience. The train is slow, makes a bunch of stops, and of course, full of locals and fellow travellers. I was a solo traveller in second class and met a young German couple also going to Meteora to experience its majesty. The train is comfortable with overhead racks for carryon -- travel light -- and there is a food car with decent and reasonably priced sandwiches and drinks. Most people carry on their own food which is a pretty good idea. If you are travelling with others, then the trip will go faster but 5 hours is a very long time on this multi-stop train. It took less time to travel from Newark to Phoenix than Athens to Meteora although the food was better on the train. Kalambaka was charming, the hotel ok but I wouldn't want to stay there again Hotel Orpheus, and dinner and breakfast in this tour included which was ok. Despite the rain and fog February is NOT a prime month to visit, but better than not visiting, Meteora was one of the most jaw-dropping experiences ever. Do what you can to see it! Everything met with our expectations, this is an incredible place and totally unique. Our guide was very knowledgeable and friendly. Unfortunately the 4 star hotel was sold out and our 3 star hotel was nice in many ways. The included dinner was not especially good though. October is absolutely the perfect time for visiting Greece, the temperature is just right and there are fewer tourists. The trip to Meteora was one of the most wonderful tours I have taken in any country and is highly recommended. We were issued first class train tickets and picked up at the train station by a taxi and driven to our hotel. The hotel was nice especially the staff and the dinner and breakfast buffet were good. But what made the tour really special was our guide James who was born in the area and our driver. We saw five monasteries visually and visited three. All three monasteries we visited were really interesting. We met other people on the train who were doing an independent visit and they saw only one monastery while we saw three in one morning! The information and commentary provided by James throughout the trip was interesting and entertaining. We took the train into Kalambaka and stayed at the Divani Hotel. The train ride lasts about 5 hours, but the time is well-worth the trip. 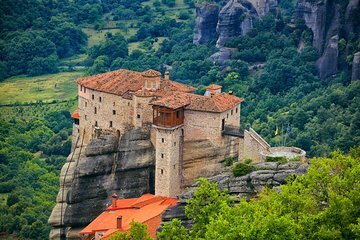 Meteora is simply amazing in history and for touring the monasteries. The overnight trip is important to be able to see the monasteries in the morning, as most of them are closed in the afternoon. Everything is taken care of on this trip - train tickets, taxi to hotel, and knowledgeable tour guide thank you Dimitrius! While once in the town of Kalabaka everything went smoothly, getting there was not so easy. We missed our train and had to buy bus tickets to get to Kalabaka. They only phone# we had was for our taxi driver who helped. The tour of the monasteries was great and our guide was friendly, andl informed.